Did you know that Americans spent $58 billion in 2014 on their pets? Yes that’s billion with a “B!” It’s true, our pets are treated as family members, if not better! After food, keeping pets healthy is the number two area of money spent. Vet visits raked in $15 billion! Protecting our pets from illness and germs is important to us and I’m sure all agree the cleanliness of the vet office plays a big part in fighting viruses. Did you know Parvovirus is a highly contagious disease that could bring about a life threatening illness to your dog? How is it transmitted? This virus is transmitted by people, other animals or even objects like shoes or floors that come in contact with an infected dog’s feces. The virus has the ability to live for months, there are different strains (like the flu) and as of now, there is no medication available that can kill the virus. The best protection is not only preventative, through vaccines but proper cleaning and disinfecting, and it’s uber important in places where several dogs congregate, such as a veterinarian’s office, or doggie day care. It’s important that products used to clean these areas have no dwell time. Meaning they don’t have to sit on the surface for 10 minutes before they are effective. Products containing Accelerated Hydrogen Peroxide (AHP) technology are germ-killing disinfectants, excellent cleaners, non-toxic and safe for people and pets. This cleaner instantly kills harmful viruses such as Norovirus, Parvovirus and Poliovirus. It’s ideal for use in cleaning vet front and back office areas and boarding facilities, and keeping instruments, exam tables, lobby flooring and general areas clean and healthy. It supports infection control and helps create a healthy, safe environment for pets and their owners. Keeping a healthy facility also includes keeping it free of fur and dander. We all know animals shed but they can shed even more when they are nervous. Does your vet office have little tumbleweeds of dog or cat hair collecting in the corners of their examination rooms? Ew! What about dander? Those little flakes of animal skin that fly through the air and stick to many surfaces. Rooms should always be wiped down with disinfectant and swept between patients and thoroughly vacuumed after hours with a HEPA-filtration machine. Why use a HEPA filtered vacuum you ask? Because they are the bomb! Did you know they capture up to 99.97% of airborne particles as small as .3 microns and that makes it extremely efficient at removing allergens such as dust mites and animal dander and with some brands you can empty the recepticle after every use. With continued use the HEPA filter can help improve air quality and reduce dust. AQC loves pets and we take special care in cleaning Veterinarian clinics! 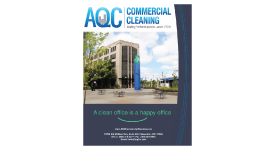 If you notice your pet’s special clinic is not as clean as it should be, mention it to them and let them know you would like to refer AQC, a cleaning company that cares and can make a big difference in the health of their patients! Your best friend will thank you, woof, you’re welcome!